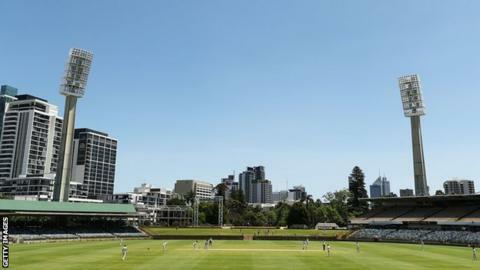 There is "no evidence" that the third Ashes Test between Australia and England in Perth has been "corrupted", says the International Cricket Council. The Sun claimed Indian bookmakers offered to fix aspects of the match. "We have now received all materials relating to The Sun investigation," said Alex Marshall, the ICC general manager anti-corruption. "There is no indication that any players in this Test have been in contact with the alleged fixers." The Test started on Thursday at 02:30 GMT, with Australia leading 2-0 in the series. They will regain the Ashes if they win any of the final three matches. The Sun reported that a gang, working with an Australian called 'the Silent Man', was charging up to £138,000 to influence the game. No England players were named as being involved but the gang claimed to have recruited one former Australian player. England captain Joe Root, who said he had been "made aware" of the claims, told BBC Test Match Special: "It's very sad that this has been written about. "We've got to focus on this Test match and do everything we can to win it." Australia skipper Steve Smith said: "As far as I know, there's nothing that's been going on or anything like that. There's no place for that in our game." It is unclear how the bookmakers proposed to fix the Test, although, according to the newspaper, one told Sun investigators he could "get players to follow 'scripts' - such as how many runs would be scored in a session, or an innings, when a wicket will fall and what a team would do if it won the toss". Marshall added: "We take the allegations extremely seriously and they will be investigated by the ICC Anti-Corruption Unit working with anti-corruption colleagues from member countries. "The allegations are wide-ranging and relate to various forms cricket in several countries, including T20 tournaments." An England and Wales Cricket Board statement read: "We are aware of these allegations and there is no suggestion that any of the England team is involved in any way." Cricket Australia chief executive James Sutherland said: "Cricket Australia, the ICC and the England and Wales Cricket Board have a very strong stance against corruption. "Any credible allegations will be taken very seriously. We have a zero-tolerance approach to corruption and we take seriously any allegation that threaten to undermine the integrity of our sport." Based on the information in the dossier received from the newspaper, Sutherland said: "There's no evidence, substance or justification to suspect that this Test match or the Ashes series as a whole is subject to corrupt activities." He said Cricket Australia had "full confidence" in its players. What difference does an extra 5mph make for a fast bowler?